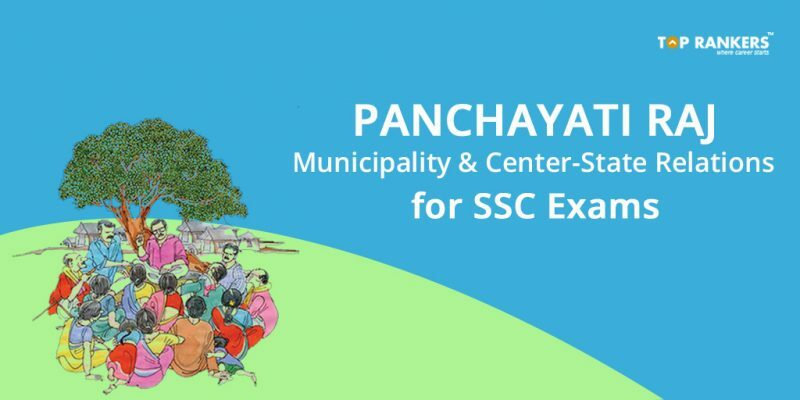 Panchayati Raj, Municipality and Center-State Relations for SSC Exams are explained in detail along with all the functions of panchayati Raj, Municipality and Center-State relationship. In India, the Panchayati Raj is the system introduced by constitutional amendment in 1992, although it is based upon the traditional panchayat system of South Asia. The Panchayati Raj system was formalized in 1992, following a study conducted by a number of Indian committees on various ways of implementing more decentralized administration. Mahatma Gandhi advocated Panchayati Raj as the foundation of India’s political system, as a decentralized form of government in which each village would be responsible for its own affairs. The term for such a vision was Gram Swaraj (“village self-governance”). Instead, India developed a highly centralized form of government. However, this has been moderated by the delegation of several administrative functions to the local level, empowering elected gram panchayats. There are significant differences between the traditional Panchayati Raj system, that was envisioned by Gandhi, and the system formalized in India in 1992. In India, the Panchayati Raj now functions as a system of governance in which gram panchayats are the basic units of local administration. The system has three levels: Gram Panchayat (village level), Mandal Parishad or Block Samiti or Panchayat Samiti (block level), and Zila Parishad(district level). It was formalized in 1992 by the 73rd amendment to the Indian Constitution. Provide essential services and facilities to the rural population. Supply improved seeds to farmers and inform them of new farming techniques. Set up and run schools and libraries in rural areas. Start primary health centers and hospitals in villages; start vaccination drives against epidemics. Execute plans for the development of the scheduled castes and tribes; run ashram shalas for Adivasi children; set up free hostels for them. Encourage entrepreneurs to start small-scale industries and implement rural employment schemes. Construct bridges, roads and other public facilities and their maintenance. Municipal governance in India has existed since the year 1688, with the formation of Madras Municipal Corporation, and then Calcutta and Bombay Municipal Corporation in 1726. In the early part of the nineteenth century almost all towns in India had experienced some form of municipal governance. Then Viceroy of India, Lord Ripon’s resolution of local self-government laid the democratic forms of municipal governance in India in the year 1882. In 1919, a Government of India act incorporated the need of the resolution and the powers of democratically elected government were formulated. As per the Constitution of India, 74th Amendment Act of 1992, the latter two categories of towns are to be designated as municipalities or Nagar panchayats with elected bodies. Until the amendments in state municipal legislations, which were mostly made in 1994, municipal authorities were organised on an ultra vires (beyond the authority) basis and the state governments were free to extend or control the functional sphere through executive decisions without an amendment to the legislative provisions. Housing facilities for low income groups. Construction and maintenance of gardens, libraries, rest houses, public parks, rescue homes for women, museums and orphanages. Provision of transport links with the municipality. Promotion of welfare of employees of municipalities. Securing or removal of building or places that are prone to dangers. Building and maintenance of primary school. removing obstruction and projections in public paths, bridges and other areas. Lighting and watering the public streets. Maintenance and developement of the public hospitals. Construction and maintenance of public streets. India has a federal system of governance. The Union and the State Governments derive their authority from the Constitution. In legislative relations, there is a three tier divisions of power in the Constitution. We follow a system in where there are two subject lists describing legislative powers, known as the Union List and the State List respectively. There is an additional list called the Concurrent List. The Union List which consists of 100 subjects of national interest and it s the largest of the three lists. It has some important subjects included in this list are: Defence, Railways, Post and Telegraph, Income Tax, Custom Duties, etc.The Parliament has exclusive power to make laws on subjects listed in the Union List for the whole country. The State List consists of 61 subjects like Trade and Commerce within the State, Police, Fisheries, Forests,local governments, theatres, Industries, etc. The State Legislatures have power to make laws on the subjects included in the State List. The Concurrent List consists of 52 subjects like Stamp Duties, Drugs and Poison, Electricity, Newspapers, criminal law, labour welfare, drugs,etc. Both the Parliament and the State Legislatures can make laws on subjects included in this list. But in case of a conflict between the Union and the State law regarding a subject, the Union law prevails over the State law. Parliament has the power to legislate over all subjects not included in any of the three lists. And, under certain circumstances, the Parliament can legislate on the subjects mentioned in the State List also. The executive power of the State is to be exercised in compliance with laws made by the Parliament. Also, the Union Executive is empowered to give directions to a State, when necessary like- construction and maintenance of means of communications, declared to be of national and military importance, and also on the measures for the protection of Railways. The parliament can adjudicate on inter-state river disputes. Furthermore, a provision has been made for an Inter- State Council to advise the President on inter-state disputes. State governments can delegate few of its administrative functions in the State subjects, to the Union Government for a period of time. Constitution of India has provisions to ensure uniformity of the administrative system. It includes the creation of All India Services such as IAS and IPS and allocate them to key administrative positions in the states. The presence of All India Service Officers paves way for the Central Government to exercise its authority and control over the states through them, as the Union has authority over the members of All-India Services. The members of these services are recruited by the center but appointed in the States. No disciplinary action can be taken against them by the State Governments without the permission of the center. The Constitution has the provision for creation of new All India Service by the Parliament on recommendation of the Rajya Sabha. The Union Government can direct and interfere with the state autonomy in the field of administration. Both the Union and the States have with independent sources of revenue as provided by the Constitution. The Parliament can levy taxes on subjects included in the Union List. Similarly, the States can levy taxes on subjects enlisted in the State List. Generally, taxes that have an inter-state base are levied by the center and those with a local base are levied by the State. Taxes levied by the Union but collected and appropriated by the State – stamp duties and duties of excise on medicinal and toilet preparations etc. Taxes levied and collected by the Union but assigned to the States – railways, sea or air etc. Taxes levied and collected by the center and may be distributed between the center and the States by Parliament law, such as union excise duties,excise on toilet preparations etc. Taxes levied and collected and retained by the center – customs, surcharge on income tax etc. Additionally, center can exercise control over the state finances and grants-in-aid (general and special) to meet their expenditure. During financial emergency, provisions regarding division of taxes between the center and the State can be suspended, restrictions on the expenses of the State can be put in place. States have to carry out the Centrally-sponsored schemes. Stay tuned for more informative articles like this. If you have any query or suggestion, Do write us in the comments below.